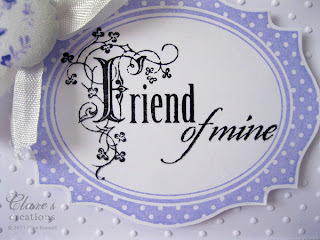 The postman brought me a lovely packet this morning, inside was the Crate Paper Friend of Mine Kit available from The Craft's Meow I can't wait to use the gorgeous Crate papers but I had to use this lovely 'Friend of mine' stamp included in the kit! It's so pretty and designed by Claire Brennan. I also made this card with this week's challenge (CCCB#50) at the City Crafter Challenge blog in mind, the theme is 'Celebrate Good Times', you have to include a banner or the word 'party' on your project. I also used the colors from this week's challenge at The Play Date Cafe (PDCC74). The label is from Very Vintage Labels No.18 from Waltzingmouse Stamps, stamped in VersaMagic Pretty Petunia. I cut the label out by hand. As I mentioned the sentiment is from The Craft's Meow. 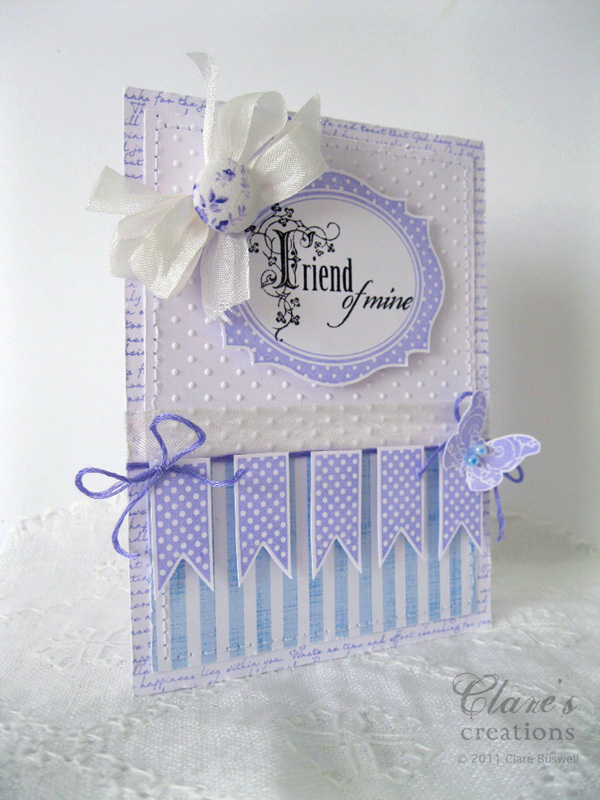 The background is plain white card embossed with Swiss Dots embossing folder. I made a double bow from white seam binding and added a fabric covered button. The banner I made using Bitty Banners from Waltzingmouse Stamps. The butterfly at the end is from the same set as the sentiment Friend of Mine. 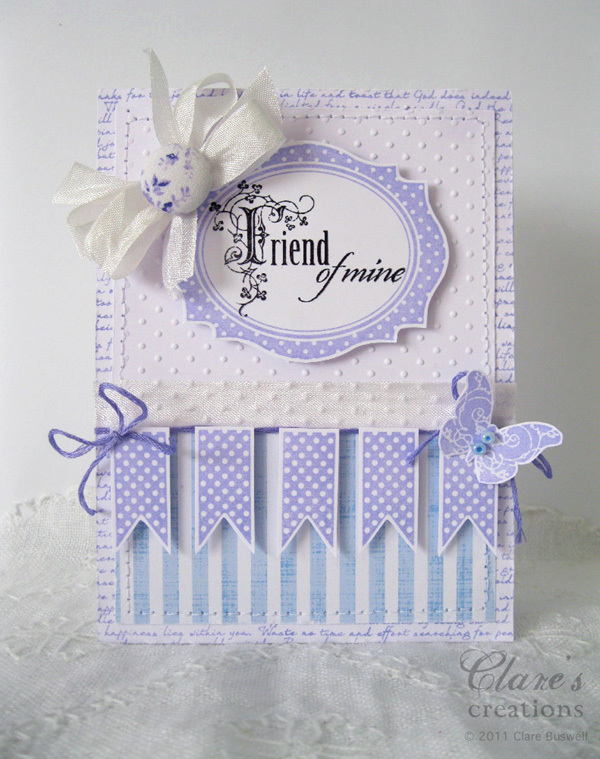 The background paper is stamped with text from Text-It by Waltzingmouse Stamps. The blue stripe paper is from a digital set but I can't remember which, it was in my scraps box! Must dash, should be working on a quilling project!! Other: Swiss dots embossing folder, die-cutting machine, sewing machine, lavender embroidery floss, blue beads, fabric covered button, white seam binding, foam pads. Gorgeous card, Clare. And that stamp is really lovely. Very pretty and sweet...LOVE IT!!! Beautiful. The blue and purple works so well together. I love that bannner too! My jaw hit the floor when I saw your card - that's how breathtaking it is. SO glad you shared this with The Play Date Cafe. Fantastic card Clare, the banner is excellent, and I love your colour combination, so pretty. Oh, Clare, everything you touch turns to beautiful! I absolutely love every detail of your card. THanks for playing with us at The Play Date Cafe, Clare! HOpe to see you again soon. Oh, my gracious! I'm swooning! LOVE every last detail about this creation! Thanks so much for joining us this week at The Play Date Cafe! Lovely colors and cute banner, thanks for playing along with us at CCCB! Love your soft sweet take on the colors! Your banner is delightful and I love all the texture!! Glad you played with us at The Play Date Cafe! Beautiful - every little detail!! The colors are so clean and fresh! WOW, amazing! Such a fabulous design and amazing details! Love all the texture you've added. Too gorgeous for words just as always! LOOOOOOOOOVE the soft colors of this card--beautiful banner! You rocked this challenge;) Thanks so much for playing along with us and joining in the fun over at the PDCC! This is so elegant, totally in love with it! This is so beautiful! I love looking at all the details. Love the card! Perfect for spring! This is an absolutely gorgeous card! I love everything about it. WOW, this is gorgeous! Congrats on being in the Fab 4 at PDCC! Absolutely stunning Clare, you've really hit the spot with this! Love it! This is gorgeous! Love the soft purples and white. Very crisp, clean and elegant. Your banner is very cute. I have some catching up to do...congrats on being one of the FAB4 at PDCC. So well deserved; this is gorgeous!!! WOW!! This is so soft and pretty.. I just love it.. Thank you so much for playing along with us at CCCB! This couldn't be lovelier! LOVE it sooooo much! The Shabby Tea Room turns ONE! !